Brenner has acted in both the Johannesburg and Pretoria seats of the Gauteng High Court. In 2012 he also acted in the North West High Court. She holds an LLB from the University of Cape Town and a Post Graduate Diploma in Corporate Law from Unisa. From 1989 to 2004 she worked in various attorneys firms before setting up her own practise in 2004. 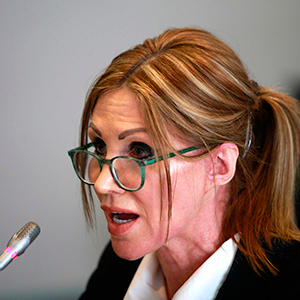 Attorney Tanya Brenner managed to do what no candidate appearing before the Judicial Service Commission (JSC) has managed in the past three years — disarm Economic Freedom Fighters member of parliament Julius Malema into not asking any questions. Laughter ensued. “At least we have something in common, Mr Malema,” continued Brenner. A smiling Malema declined to ask any questions as Brenner started a surreal monologue in broken isiZulu. Brenner was also probed about what she had done to assist in transformation of the legal fraternity while she was an attorney at a well-known law firm. She said she had tried to take on black and disabled candidate attorneys but had been shut down by her “autocratic” boss. Later, when given the opportunity to retract the statement, Brenner described the law firm as a “quasi-military operation”. She later apologised for these indiscreet remarks. Further commenting on her contribution to transformation, Brenner said she had used black assessors when she had acted at the Gauteng High Court and had briefed black counsel where she had the power to do so — especially when she started her own practise. Sifiso Msomi, one of four appointments to the commission by President Jacob Zuma, asked Brenner to talk to her understanding of judicial activism and judicial over-reach. Brenner said judicial activism was “sanctioned by the Constitution”. As an example of where this was “justifiable”, Brenner cited a recent case where two Western Cape High Court judges who were hearing criminal review cases “noticed the inordinate delay” in some of these cases from several magistrates courts reaching the High Court. In some instances the appeals took as long as two years to reach them. The high court handed down an order directing the magistrates court to send a list of judgments to be reviewed so that oversight on these appeals could be exercised. Brenner said her “ability to interact with anybody from any walk of life” and her “empathy for people” were the attributes which would stand her in good stead on the Bench. She also said that her work in family dispute law and divorce work made her able to “identify when women seek the comfort of the law” with regard to care, maintenance and guardianship issues.